We bring you a mod that takes care of adding changes in the villages of Minecraft. Village-Up 1.6.2 and 1.5.2 is a modification to improve the towns in the game. So, random villages will appear in any possible biome. They usually have larger dimensions and new completed crops and constructions. Among the new buildings we can find a prison, with an abominable villager inside. 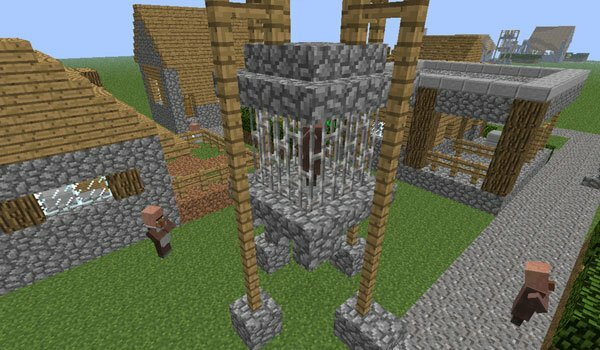 How to install Village-Up Mod for Minecraft 1.6.2? How to install Village-Up Mod for Minecraft 1.5.2? New possibilities for the villages of Minecraft! I paste the .zip file into my mods folder but it’s not working ? @Martin, you need to paste the class files in minecraft.jar. Thank you.